Ran When Parked: A quick look at the Fiat Tempra Coupe. A quick look at the Fiat Tempra Coupe. Every now and then a car manufacturer comes out with a car that no one saw coming, the kind of car that generally marks a break from the past and a leap into the future. On the opposite end of the spectrum there are cars that almost go unnoticed when they are launched. The Fiat Tempra falls in the second category. Launched in 1990, it was essentially what everyone expected Fiat would build to replace the Regata: a four door version of the Tipo. 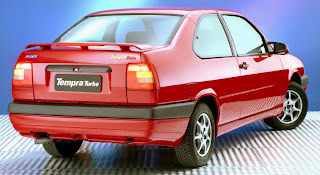 In Europe the Tempra slotted between the aforementioned Tipo and the Croma as Fiat’s midsize sedan. It was powered by a variety of gas and diesel engines ranging from 1.4 to 1.9. Early gas engines were carbureted but the copious amount of laws passed by the European Union in 1992 killed them off in the name of emission restrictions so the Tempra soon adopted fuel injection. Perhaps the most interesting variant in Europe was a 4x4 wagon named the Tempra SW that was powered by an 8v 2.0 gasoline engine to cope with the extra weight of the 4x4 system. 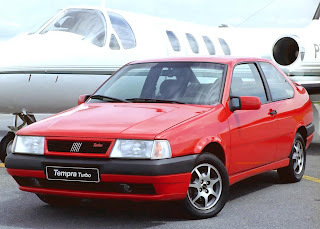 The Tempra was also built in Brazil starting in 1992 but since the Croma was not available there, it had to take on the vocation of Fiat's flagship sedan. This was problematic because the European version of the Tempra was not flagship material. To be able to sell it in Brazil as an upscale car Fiat of Brazil made several changes inside and out, including larger exterior mirrors, a different suspension setup to make it more adapted to local roads, and a longer list of standard equipment. To further add to the luxury image, the Brazilian Tempra was available as a premium coupe starting in 1993, a bodystyle that was not available anywhere else in the world. The coupe was powered by either a 2.0 Turbo or a 2.0 16v but both engines lost power when they were adjusted to run on Brazilian fuel, which often times contains alcohol. The coupe’s dash was given a new round design and the rear window wiper was judged as unnecessary and deleted. The 2.0 16v caused a huge amount of ink flow in the Brazilian press because it was the first engine sold there to have four valves per cylinder. It put out 127hp (or 28hp more than its 8v sibling) and hit 62mph in 9.8 seconds. The turbo 2.0 only had eight valves but was good for 165hp thanks to a Garrett turbocharger. It took 8.2 seconds to reach 62mph which earned it the title of fastest car in Brazil at the time. Both the turbo and the 16v Tempra coupes had numerous standard and optional luxury equipment that included fake wood trim on the dash, electric leather seats and ABS brakes. 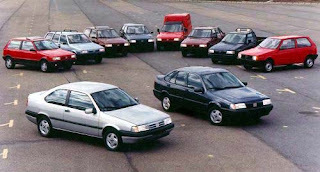 The Tempra coupe was short lived: production ended in 1995 while the Tempra sedan lived on in Brazil until 1999 and in Europe until 1997. When the European press caught wind of the coupe certain rumors spread that it would soon be arriving on European shores but it never did and many wonder why. The answer lies in another car that shared space on a Fiat showroom at the same time, the Bangle-designed Fiat Coupé. It was introduced in 1993 and shared many aspects with the Brazilian Tempra coupe, including its Tipo platform and both 2.0 engines. In the Coupé the 2.0 turbo was pushed to 195hp and the 2.0 16v to 142hp. It was well-equipped, very quick and reasonably priced and Fiat feared that if they sold the Tempra coupe in Europe it would cannibalize the Coupé. Above: an early Fiat Coupé. Later in the production run it was available with a 5-cylinder 2.0 20v turbocharged engine that logged 220hp and 0-62mph in 6.5, making it one of the fastest Fiats ever built. We've updated our display case page dedicated to scale models, you can find it here. I've never heard of the Tempra, much less the Tempra Coupe. They look like fun. I wish you guys would do a feature article on the Fiat Coupe (bangle one) - really cool car that i've never really read much about. James, don't worry, I think most folks here have never heard of the Tempra either. Thanks for the suggestion on the Fiat Coupe, we'll get on it in the near future. Hello Ronan, I found your blog quite by chance and especially enjoyed reading thie post, as I was closely involved with the Tempra's introduction in Brazil. (At the time, I worked as an account planner for Fiat's ad agency here.) Like you, I also have a non-commercial automotive blog which I would like to invite you to visit: www.adverdriving. blogspot.com. Although it is in Portuguese only, I you might enjoy it. Cheers!